The reason why I stop visiting hair salon for hairstyling such as straightening and rebonding, is because I noticed that my hair is getting thinner lately and falling out like crazy. Hair is woman's pride and crowning glory and the thought of getting bald scared me a lot. 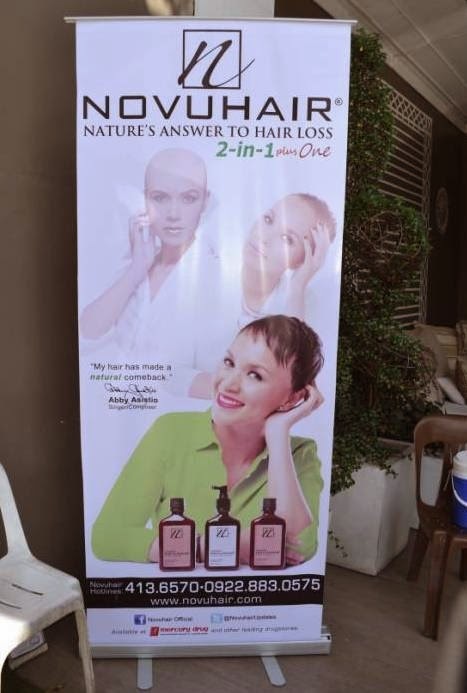 At Relish Restaurant last May 14, 2014, Novuhair 2-in-1 gave me an specific answer to hair loss. 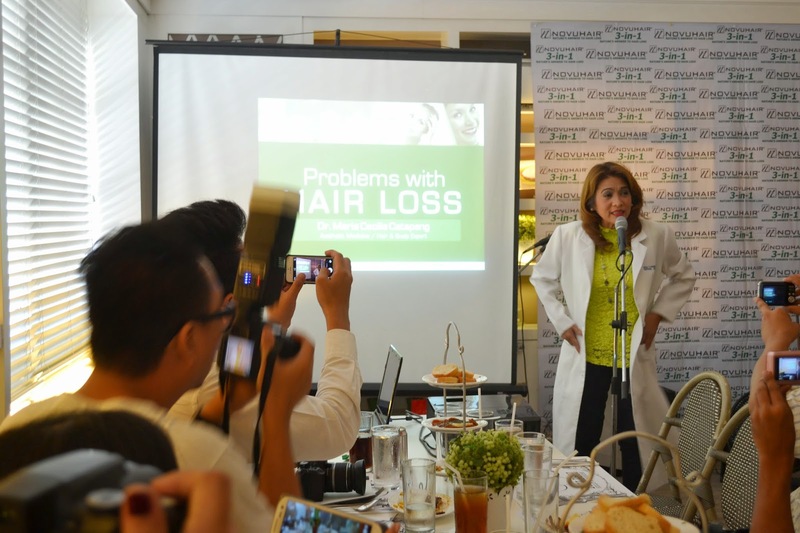 I learned more about the problem and the solution with the hair and scalp expert guest speaker, Dr. Maria Cecilia Catapang. Dr. Catapang discussed Alopecia Areata, a hair loss problem which is difficult to treat. Alopecia areata is an autoimmune disorder where the immune cells of the body go against the hair follicles making the hair strands weak at the base and easy to pluck. It is characterized by bald patches on the scalp that may join together and eventually render an individual hairless. Alopecia areata and may also attack other hairy parts of the body such as the eyebrows and pubic area. Alopecia has many types, among them are pattern hair loss or common baldness; telogen effluvium or temporary hair shedding; and alopecia areata which is considered the hardest to treat. Alopecia Areata is generally asymptomatic where the patient is often unaware of bald patches because there are no symptoms of pain or itching. Extreme stress is said to trigger the condition in genetically susceptible individuals, though inconclusive. It is important to seek an advice from an expert for proper advice and treatment. Alopecia can affect both men and women at any age. Its onset cannot be prevented and there are no studies to prove that healthy lifestyle can help cure the disease. Among the products available in the market today is Novuhair. Dubbed as nature’s answer to hair loss, Novuhair is made from all-natural ingredients, including moringa oleifera, panax ginseng, virgin coconut oil, as well as the essential oils of rosemary, peppermint and lavender. Collectively these ingredients help improve blood circulation and increase nutrient flow to the scalp. In my hair analysis done at the event, I discovered that my hair still shows normal with 3 to 4 strands in my follicle but you see, given my age, I should use Novuhair as maintenance to keep my hair not just thick but strong and healthy as well. 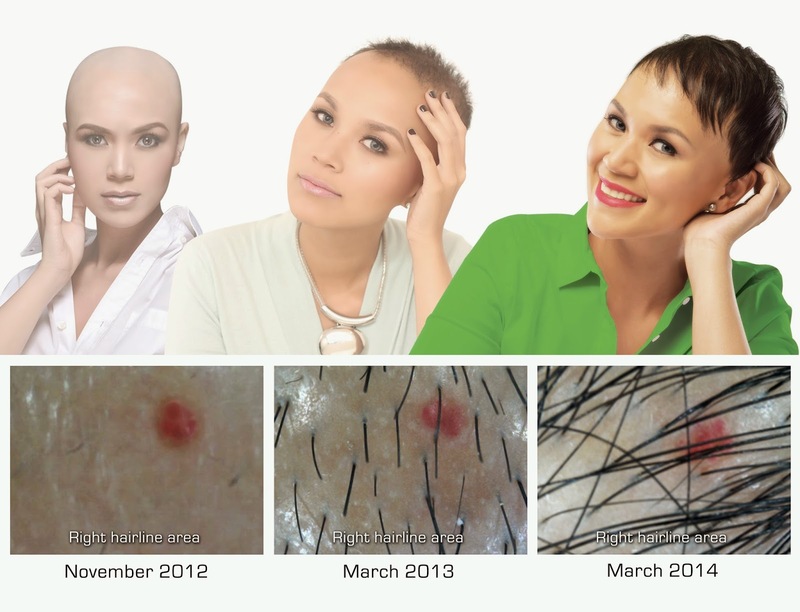 Abby Asistio, songwriter and TV host, has been suffering from Alopecia Areata since she was four years old. “I went through a lot of tough periods in my life. Growing up, I accepted the fact that I could never meet that standards set by the world when it comes to beauty. If I were to even fit in and be considered normal, I must resort to hiding under hats, bandanas and my ever reliable wigs,” said Abby. Abby lived through the entire process of experiencing hair fall: losing it little by little, and then deciding to shave it all completely. She even tried other hair loss remedies when she lived in the US for several years, including chemical-based products that have resulted in negative side effects. She was just starting to finally embrace her “baldness”, when upon prodding from family and friends, Abby decided to give Novuhair a try. She experienced remarkable results in just a few months of regular use. “It was the first time since I was diagnosed with the disease that I actually saw hair growing on my scalp. I never stopped using Novuhair since,” remarked Abby. Abby became the newest brand ambassador of Novuhair late last year alongside TV host Kim Atienza. Past endorsers include hairdresser Fanny Serrano, beauty queen Gwendolyn Ruais and athlete Andrew Wolff. “We at Novuhair are very happy to welcome Abby to our growing family. We are very happy for her as she triumphs over alopecia areata. 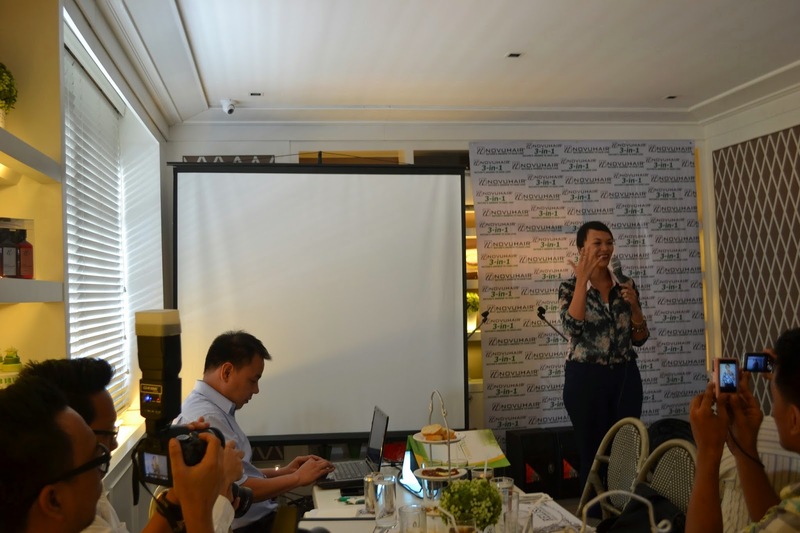 Her testimonial is more than enough proof of our product’s efficacy,” says Sheila Mae Velilla, President of Nutramedica Inc. 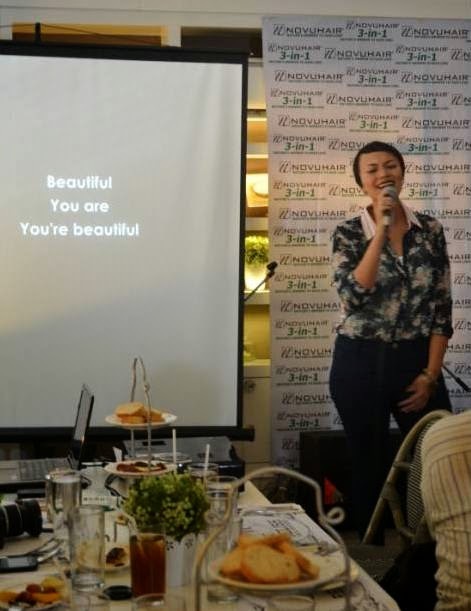 Things are looking bright for Abby as she recently launched her album “Beautiful”. But i know some friends that are having problems with 'hair loss" I should let them know that there's this kind of product. Thanks for sharing!